L'actriz y cantaire britanica Julie Andrews, en una imachen de 2003. 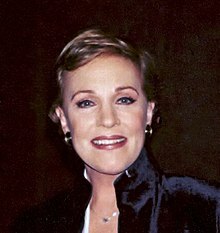 Julie Andrews (nombre artistico de Julia Elizabeth Wells), naixita de Walton-on-Thames (Surrey, Anglaterra) l'1 d'octubre de 1935, ye una actriz y cantaire britanica, activa en o cine britanico dende zaguerías d'os anyos 1940 y con quantos premios recibitos mientres a suya carrera cinematografica. D'entre a suya filmografía, cal destacar as suyas interpretacions en cintas como Mary Poppins (1964, Robert Stevenson), The Sound of Music (1965, Robert Wise), Thoroughly Modern Millie (1967, George Roy Hill), Star! (1968, Robert Wise), Darling Lili (1970, Blake Edwards), 10 (1979, Blake Edwards), Victor Victoria (1982, Blake Edwards), u That's Life! (1986, Blake Edwards). Julie Andrews recibió en 1964 un premio Oscar a la Millor Actriz por o suyo papel de Mary Poppins en a cinta Mary Poppins, dirichita por Robert Stevenson. 1964: Mary Poppins, de Robert Stevenson. 1964: The Americanization of Emily. 1965: Salzburg Sight and Sound (cortometrache). 1965: The Sound of Music, de Robert Wise. 1967: Thoroughly Modern Millie, de George Roy Hill. 1968: Star!, de Robert Wise. 1970: Darling Lili, de Blake Edwards. 1979: 10, de Blake Edwards. 1982: Victor Victoria, de Blake Edwards. 1983: The Man Who Loved Women. 1986: That's Life!, de Blake Edwards. 2004: Princess Diaries 2: Royal Engagement. 2007: Shrek the Third (voz). 2010: Shrek Forever After (voz). Se veigan as imáchens de Commons sobre Julie Andrews. (en) Julie Andrews en IMDb. (en) Julie Andrews en Internet Broadway Database. (en) Julie Andrews en Turner Classic Movies.